Imphal, October 17 2013: The confidence to do, the determination to overcome hardships and the hard work to excel has been the key behind Rangdajied United FC's brilliant game at home in the last two round. And these rounds have seen the revolution of many players and one among them is David KC Ngaihte. David is one among the many boys from Manipur plying trade in the Indian football clubs. But what makes this Bungmual (Churachandpur) lad different from the rest is that, he became a professional footballer by chance and not by choice, unlike others who eat, drink and sleep football. With the motive to excel in academics and to get access to better education, David was sent to Delhi. In the capital, while practising with friends in the evening, as it's a norm with the North Eastern guys, a Delhi club named Goodwill FC sported him and offered him to play for them in 2008 . Even then, the college going David wasn't serious about the offer but took it up just for the sake of playing the game he loves. With nothing to prove, he caught the eyes of the capital's football aficionados and soon earned a berth for the Delhi Santosh Trophy team. He spent the next three years completing his academics and switching between Delhi clubs. It wasn't until the Santosh Trophy 2012 in Odisha that, David though he could curve out a career for himself in football. Noticed by Southern Samity in the Santosh Trophy, he joined the Kolkata club and had tremendously contributed for the team's good run in the I-League 2nd Division in 2013 that saw them in the final round of the competition. "When I decided that I will make a career out of football, I started working really hard on my game. I made football my life and made everything in my life revolve around it. But I still have a very long way to go but I am not thinking much about that. I like to take small step at a time," Ngaihte quips. Then Rangdajied United happened to David and it was no turning back since then for the deadly winger as he chose to join the Shillong side over the historic Mohammedan Sporting Club. "I wasn't readily inducted into the I-League team. 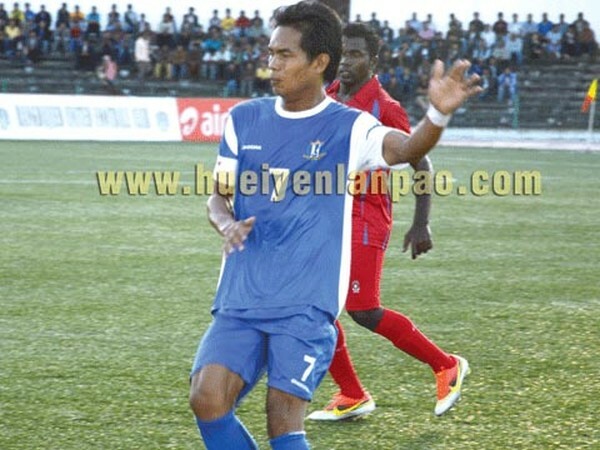 I had to prove my mettle in the Shillong Premier League and once I got the chance, I did the best I can," David said, referring to the first two I-League games where he didn't feature. And soon at home, he became the crowd's favourite. Running down opponents in the left flank with his unmatched speed and ball control, he created something every time he releases the ball. And the cheer from the crowd, every time he gets the ball, was just overwhelming for the 24-year-old. "It does feel nice to be cheered by the crowd. It motivates you to do well. But at the end of the day, what matters to me is how much I have helped my team! How have my team played! And then of course, the win and lose factor is always there," David said. The two-draw at home against Dempo SC and Churchill Brothers SC have portrayed Rangdajied as a different team with different mission. "Yes, we are really doing well and we all are a lot confident bunch now. If we keep up the tempo, which I am sure we will, we will be a team to beat even while playing away" . Attributing the change to coach Santosh Kashyap, David opines that, "We are lucky to have a coach like Santosh Sir. I really enjoy the way he trains us and the way he motivates each one of us. As a team, we have improved a lot under him and for myself, I can notice the change that he has brought in me" . Two points from four matches is not an ideal start but the way the team have played has impressed one and all. "True, it's not an ideal start. We could have won in the both the home matches but unfortunately we didn't - that's how a game goes. But I hope, we will soon start winning. Having said that, it's a long season and we will have to take one step at a time. As for now, we are focusing on the game against Mohammedan Sporting on the 20th" . Talking about his future, the Manipur lad was little coy about it but eventually opened up, saying, "I would like to play for India one day" . Looking at the way David's career graph is shaping (though its little early), it won't be long before a Rangdajied boy make it to the National Team. Hopefully, people who matters are watching David Ngaihte.